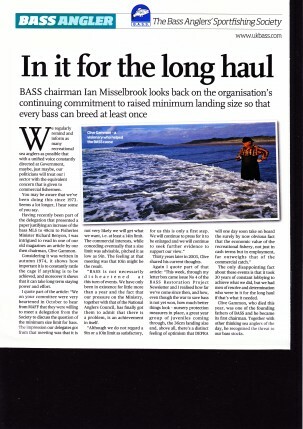 BASS Chairman Ian Misselbrook looks back on the organisation’s continuing commitment to raised minimum landing size so that every bass can breed at least once. A warm American welcome and fishing tips served up with his breakfast eggs. 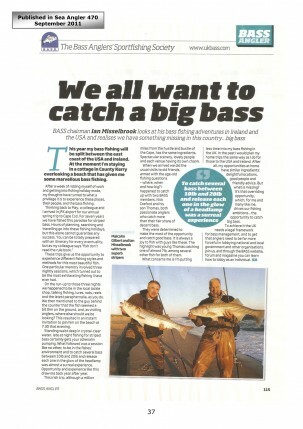 No wonder BASS member Matt Spence likes life across the pond . 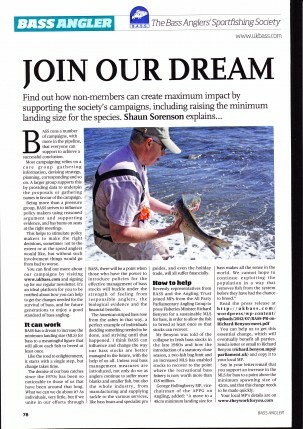 . .
Find out how non-members can create maximum impact by supporting the society’s campaigns . . . 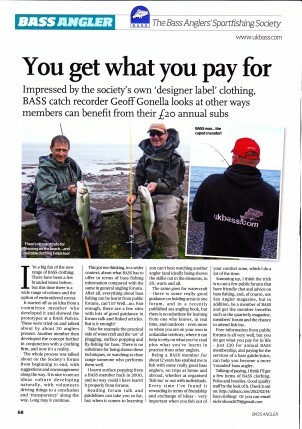 Impressed by the society’s own ‘designer label’ clothing, BASS catch recorder Geoff Gonella looks at other ways members can benefit from their £20 annual subs . . . 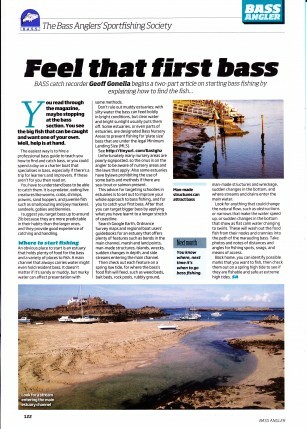 Become familiar with your local bass marks, says BASS member Julian Fox, and you’ll improve your chances of a larger fish when you venture further afield. . . .
BASS chairman Ian Misselbrook tells it straight about Sea Angling 2012. 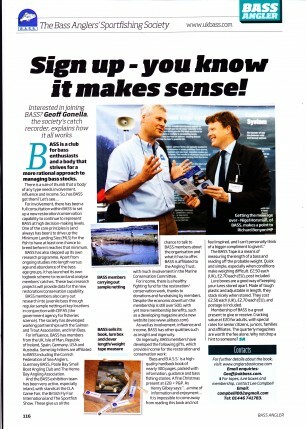 If you want more and bigger bass available to catch in years to come, lets have your attention . 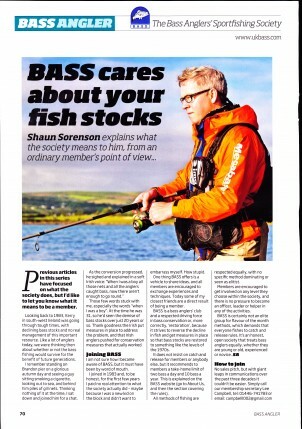 . .
Shaun Sorenson explains what the society means to him, from an ordinary member’s point of view . 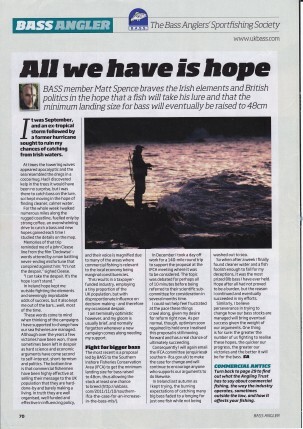 . .
Matt Spence braves the Irish elements and British politics in the hope that a fish will take his lure and that the MLS for bass will eventually be raised to 48cm. 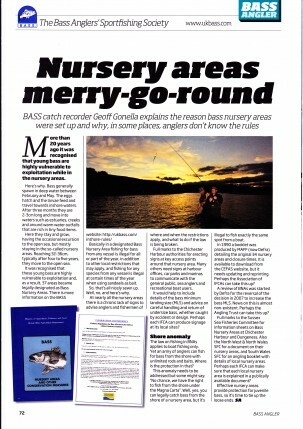 Geoff Gonella explains the reason bass nursery areas were set up and why, in some places, anglers don’t know the rules. 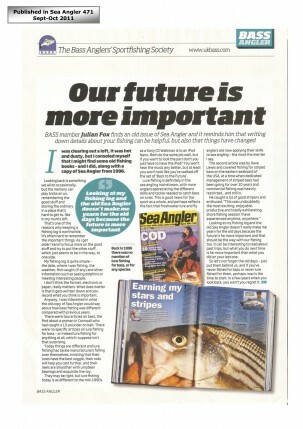 Julian Fox explains the continuing pressure on bass stocks and wonders what effect it will have on his fishing this coming season. 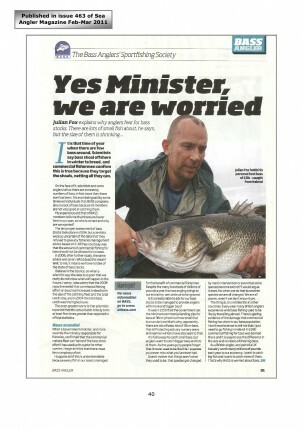 Ian Misselbrook talks about two developments that will protect Irish bass fishing. 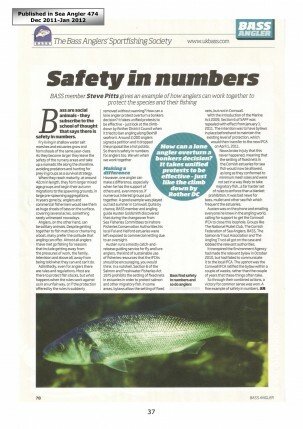 Steve Pitts gives an example of how anglers can work together to protect the species and their fishing. 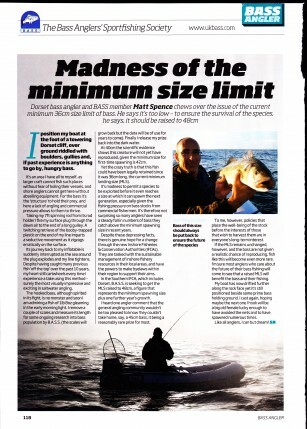 Matt Spence chews over the issue of the current minimum size limit of bass. Geoff Gonella explains what BASS is and does . 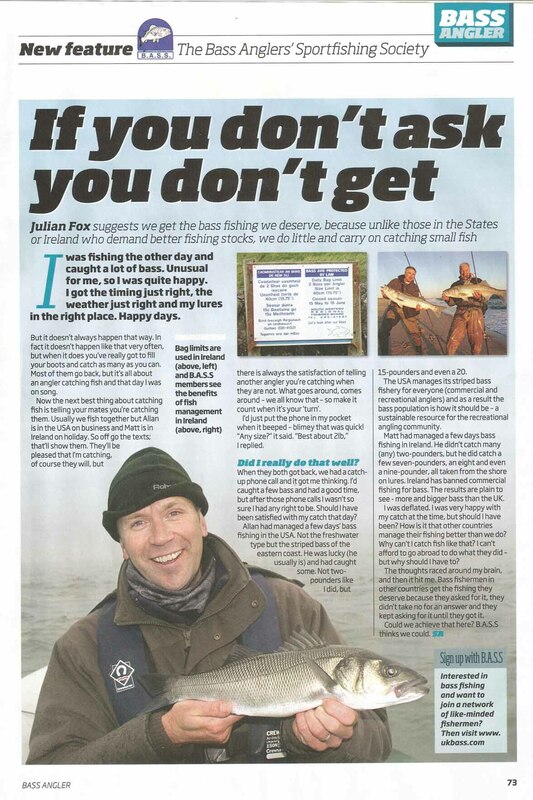 . .
Julian Fox finds an old issue of Sea Angler and it reminds him that writing down details about your fishing can be helpful . .
Ian Misselbrook looks at his bass fishing adventures in Ireland and the USA and realises we have something missing in this country . . . big bass. 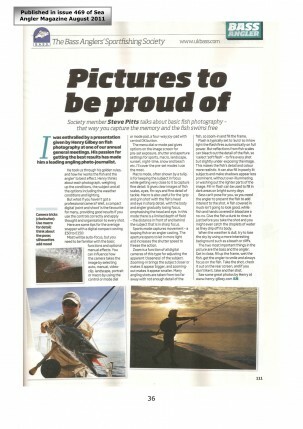 Steve Pitts talks about basic fish photography – that way you capture the memory and the fish swims free. Geoff Gonella helps anglers new to bass fishing catch that all-important first fish. 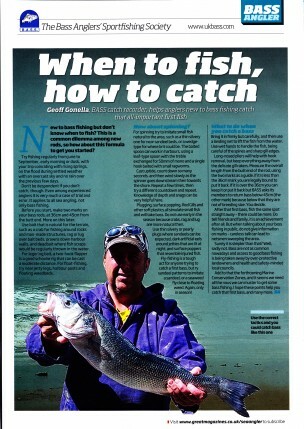 Geoff Gonella begins a two-part article on starting bass fishing by explaining how to find the fish . . .
Matt Spence comes up with an interesting theory. 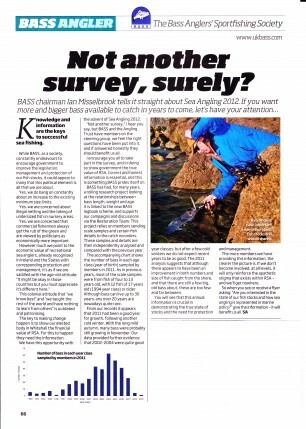 He reckonsthere could be a case for saying the fish instinctively shy away from lures once hooked and returned . 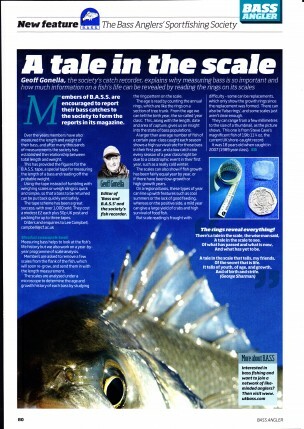 . .
Peter Macconnell confesses that he likes to wade to catch his bass . 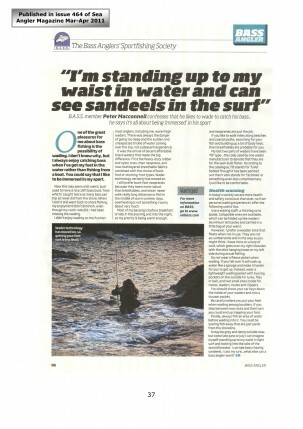 . . he says it’s all about being ‘immersed’ in his sport. 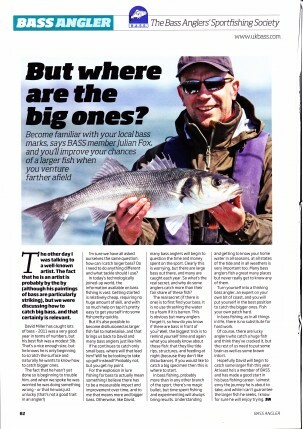 Julian Fox explains why anglers fear for bass stocks.There are lots of fish about, he says, but the size of them is shrinking . 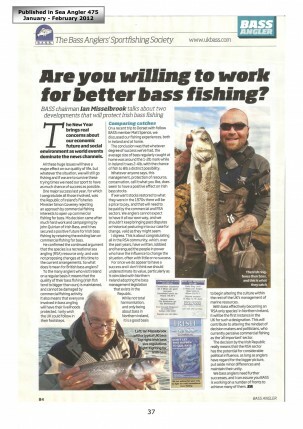 . .
BASS Chairman Ian Misselbrook remembers how he got hooked on bass fishing and why he remains optimistic about the future. 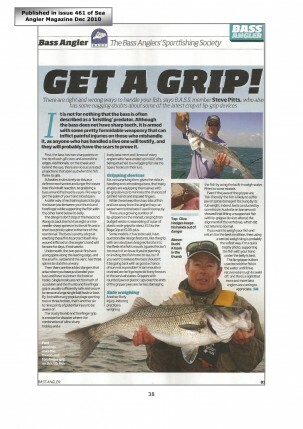 There are right and wrong ways to handle your fish, says Steve Pitts, who also has some nagging doubts about some of the latest crop of lip-grip devices. 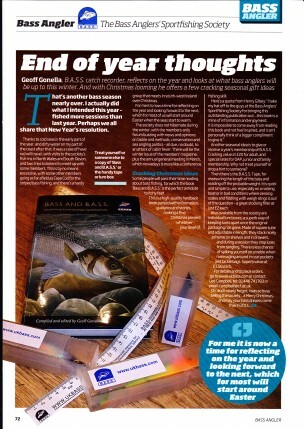 Geoff Gonella reflects on the year and looks at what bass anglers will be up to this winter. And with Christmas looming . . .
Ireland, where fantasy fishing comes true . 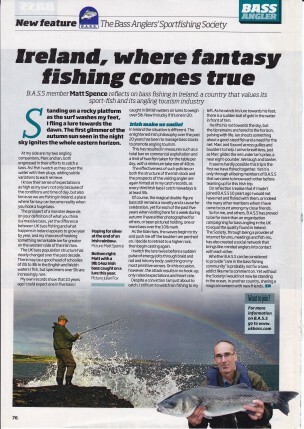 . . Matt Spence reflects on bass fishing in Ireland, a country that values its sport-fish and its angling tourism industry. 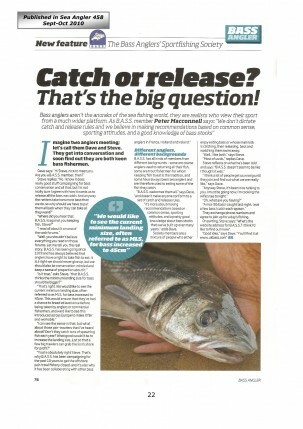 ‘Catch or release? That’s the big question! 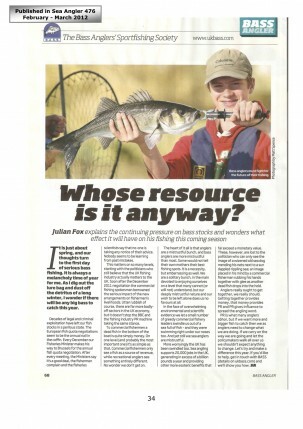 Julian Fox suggests we get the bass fishing we deserve . 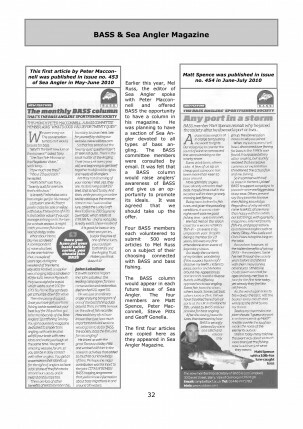 . .
Geoff Gonella, the society’s catch recorder explains why measuring bass is so important . 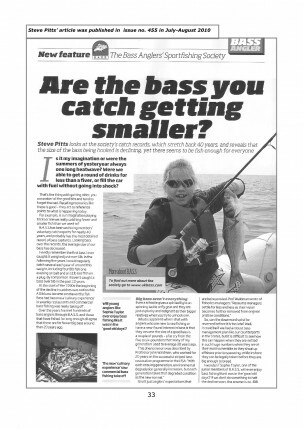 . .
Steve Pitts looks at the society’s catch records, which stretch back 40 years and reveals that the size of the bass being hooked is declining . 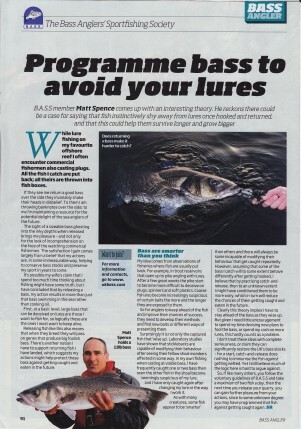 . .
BASS member Matt Spence reveals why he joined the society after he downed a port or two . 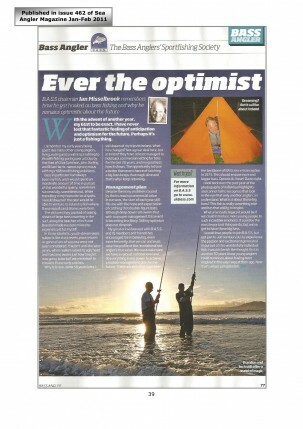 . .
Sea Angler, Issue 454, June/July 2010.